The 1 250 pupils are now sharing classrooms and even get taught in hallways as teachers are making plans to continue teaching. 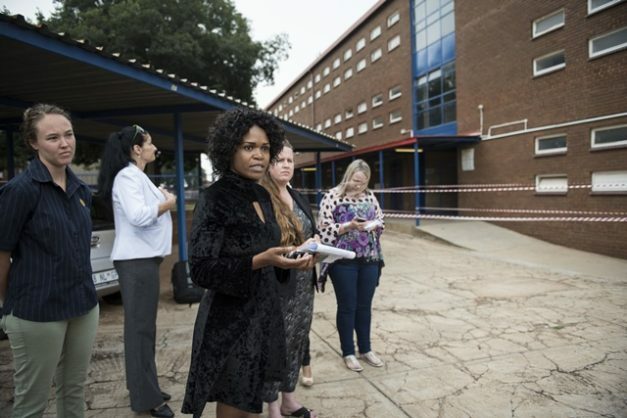 With almost half of Hoërskool Roodepoort’s classrooms being declared danger zones, 1 250 pupils at the Johannesburg school have had to share the 22 classrooms that can be used. An entire block of 18 classrooms, out of the total of 40, has been cordoned off with tape, with security guards posted around the block to ensure no one comes near the building as it has been declared dangerous. With concrete sagging an average of 60mm and gaping cracks, the school’s governing body is not taking any chances and has cordoned off the building and posted security guards all around it. This comes barely a week after a walkway at Hoërskool Driehoek in Vanderbijlpark collapsed, killing four pupils. Dr Buyi Sondezi, chairperson of the governing body, said teachers were making the most of all the spaces they had to ensure pupils were accommodated. “Teachers found a way around it, utilising every space available for teaching, including the sharing of classrooms and using halls,” she said. She said they had no idea what damaged the structure, saying it was definitely not a maintenance issue as the damage was discovered during routine maintenance checks. “It is not as a result of lack of maintenance. I cannot say it is a structural problem until an engineer makes that proclamation,” she said. Bernie Swarzen, a member of the governing body, said the damage to the building was first discovered around June 2017 during the refurbishment of staircases and walkways. He said deterioration accelerated in the first few months and the building was totally evacuated last year. The matter was reported to the Gauteng department of education. “At first, we thought it was a maintenance matter but we discovered that it was something bigger. “We are working with the department of education on finding a solution,” he said. The department has said the structural defects were caused by roof leaks. It says remedial works to be undertaken would include replacement of roof sheets and ceilings, demolition and rebuilding of all cracked brick walls, replacement of gutters and down pipes, as well as the repainting of classrooms.